Second things second. Yesterday, I posted a tutorial for a no-sew fabric postcard that takes less than 10 to 15 minutes to complete. Today, I'm showing off a fabric postcard tutorial that takes a few more minutes and a sewing machine. 1) If you want to embroider a line down the center of the side you will write on, do that first in the middle of the 4 x 5 fabric rectangle. I did this on some postcards, but not the one you see in this particular tutorial. 2) Fuse 4 x 5 inch fabric rectangle to one side of stiff interfacing according to package directions. Now center this piece in the middle of the 5 x 6 piece with and fuse to the other side of the interfacing. 3) Double-fold all the edges of the 5 x 6 piece up around the 4 x 5 rectangle and iron. 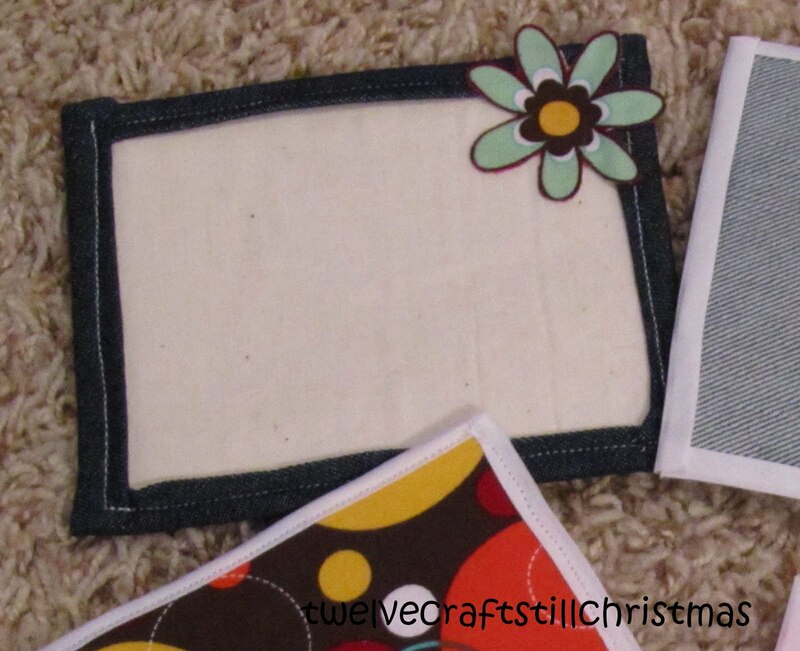 4) Sew around the folded edge. This will sew fabric and interfacing together. 5) If you used solid fabric and would like to add shapes, use Peel n Stick Fabric Fuse Permanent Adhesive according to package directions. Behold a beautifully unique postcard. Stick a stamp on it and . . .
How neat. Thanks for the great tutorial!! Those are VERY cute! And congrats on the features! I am adding you to my Reader. I just found you from your featured link on fireflies and jellybeans. I've then spent ages having a good snoop around your blog! I love it! I love the idea of twelve crafts till Christmas, and am now following you and have added you to my 'inspiration' list so I can find your blog easily again!! Thanks for sharing your wonderful creativity! These are so cute!! You've got some great ideas! Thanks for linking!